After a performance in Berlin, a singer named Sephi is approached by an elderly Polish woman who accuses her father of being a murderer. Rattled, but determined to get to the truth, Sephi and her journalist sister Nana decide to investigate their father's past to determine if the accusation is true. "Past Life" is an Israeli film written and directed by Avi Nesher, who is best known for his movies "The Secrets" and "Turn Left at the End of the World." It stars Joy Rieger as Sephi Milch, a young singer and aspiring composer. Joining her is Nelly Tagar, who plays Sephi's sister Nana. Also in the film are Doron Tavory and Evgenia Dodina as their parents Dr. Baruch and Lusia Milch. It is at one of Sephi's recitals where she is accosted by an elderly woman named Agnieszka Zielinska, played by Katarzyna Gniewkowska, who accuses Sephi's father Baruch of being a murderer. This troubles Sephi very much, so she decides to look into her father's past with the help of her sister and Agnieszka's son, prolific German composer Thomas Zielinska, played by Rafael Stachowiak, to get to the truth of the matter. Many movies about World War II have been made over the years, but few deal with it the way "Past Life" does. It is part family drama, part mystery, and part personal journey for the film's protagonist Sephi. As a young woman, she spends her days in school and is learning to compose music, though she is told by one of her instructors that this is a pipe dream and is heavily discouraged from learning composition. She, and especially her sister Nana, are strong, independent women, marching to the beat of their own drums through music (for Sephi) and journalism (for Nana). Their home life has clearly been hard because of their strict, no nonsense father Baruch, but the girls mostly do what they want, even with him looming shadow. There's a lot going on in their lives separately, but after Agnieszka confronts Sephi, the sisters work together to discover the truth about their father as old wounds are unearthed from a time he'd rather forget. There are many different threads to this story that all eventually tie together because of their father's past with the Zielinskas, and piece by piece, the veracity of these discoveries is revealed, no matter how tough or how painful it may be. We manage to get extremely invested in the mystery aspect of "Past Life" right from the beginning. We are enthralled by Sephi and Nana's investigation early on as they find people who know the truth about what happened in 1939 in a cellar that may cause others to call their father a murderer. Though much of the reveal does rely on them explicitly asking their dad what he did, the audience is kept in suspense, and we never really know if he's telling the truth until slowly, the information is divulged. The drama of the story is also captivating because Baruch has to relive the horrors and agony of what he experienced in World War II, all so he could make it out of the war alive. On the flip side, we never know if Agnieszka or Thomas Zielinska have ulterior motives against the Milches. As Sephi gets close to Thomas because of their shared love of musical composition, we begin to grow suspicious of him and his mother for a variety of different reasons. Director Avi Nesher certainly has a knack for tension-building. Joy Rieger and Nelly Tagar put on excellent performances as these (often head)strong sisters living in a late-1970's Israel. They are able to show great emotional range throughout the picture. Rafael Stachowiak also does a stellar job of walking a fine line between sincere and curious. The one real issue we had with "Past Life" is, despite holding our interest early on, it does start to meander a little bit after a while. We have feeling it's because there is so much going on within the context of the story, so many threads to delicately weave in and out of one another, that it gets a little heavy-handed with its multiple story lines. We started to wonder when it would get to its ultimate conclusion, and when the ending does come, there is some closure, but it isn't as satisfying as we had hoped it would be. 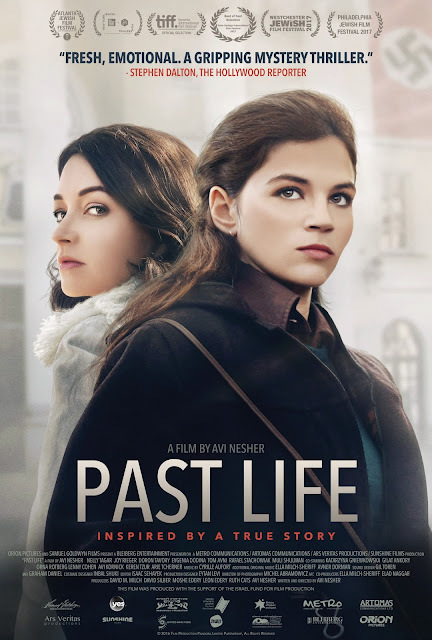 Still, "Past Life" excels when it gets to the roots of its characters, and manages to be straightforward and gripping at times, and sad and heartbreaking at others. It is a melange of wartime scars, sins of the father, hope for the future, and lessons in forgiveness.